My hypothesis is that the mutation's effect on transcription of sxy mRNA increases competence by increasing sxy translation. I've long hypothesized that slowing elongation or increasing pausing in the 100 nt segment of sxy mRNA that forms its regulatory secondary structure will promote sxy translation by increasing the ribosome's access to the sxy ribosome-binding site and start codon. Is RR753 sensitive to the inhibition of competence by added purines? What's the effect of an hfq deletion in this background? How does this strain respond to added cAMP? How does it respond to the standard competence-inducing MIV treatment? Does the mutation increase competence of a sxy mutant (sxy6) that has an extra-stable secondary structure? Does it further increase log-phase competence of the sxy hypercompetence mutants, which have weakened sxy mRNA secondary structures? She's now done all but the last of these, and we're considering what she should do next. So here we're going to summarize what she's found and what we think it means. Her first experiments gave a better characterization of RR753's growth rate. She's done both Bioscreen growth curves (high-precision analysis of exponential growth) and manual ones (lower precision but better for cultures at low and high densities). 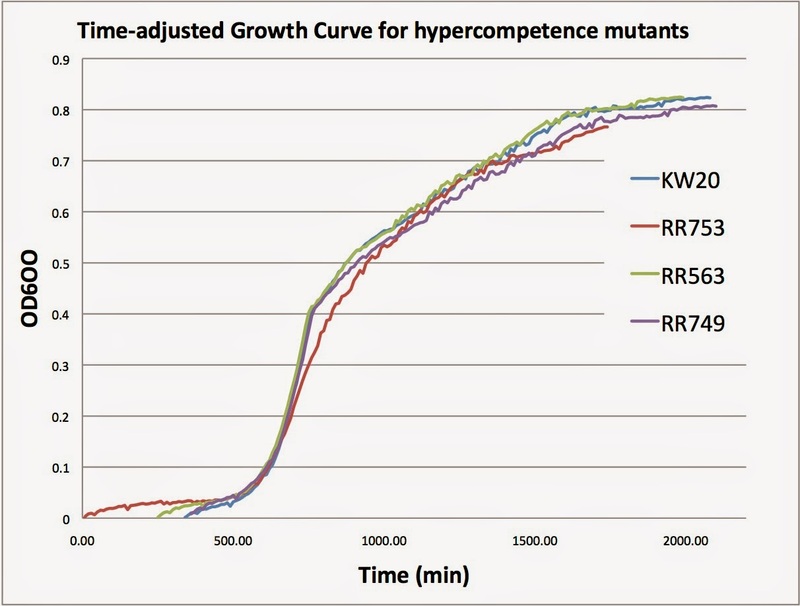 First the Bioscreen results: Here growth of RR753 (red line) is compared to wildtype cells (KW20) and two other hypercompetence mutants, RR563 (sxy-1) and RR749 (murE). This clearly shows the slightly slower exponential growth of the rpoD mutant. 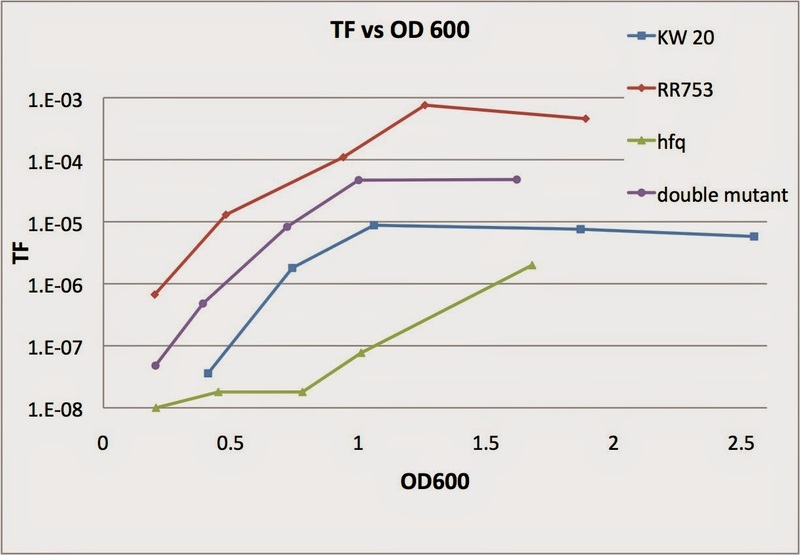 The Bioscreen analysis measures OD600, so it doesn't tell us about the actual numbers of viable cells. The tech has also done a number of manual growth curves, mostly as control parts of experiments examining other variables. These agree with the Bioscreen results in showing usually a slightly slower exponential growth rate, and no obvious differences in later survival. Her next time courses replicated my earlier measures of transformation frequency. It looks like the rpoD mutant differs from the other hypercompetence mutants (in sxy and murE) in having very low competence at very low cell density, perhaps as low as that of wildtype cells. The other mutants at 100-1000-fold more competent than wildtype cells at very low cell density. The rpoD mutant may also become highly competent at lower cell densities than wildtype cells, but may not be any different than the other hypercompetent mutants - these data are hard to interpret. What could be the significance of having very low competence at very low cell densities? I'd been assuming that the moderate competence of the sxy-1 hypercompetent mutants at low cell density reflected a baseline level of sxy transcription and an increased efficiency of translation. If the rpoD mutation acts as I've hypothesized, it should have the same effect. Provided the cells are in real exponential growth, the cell density shouldn't matter. Might the rpoD mutant have two different 'exponential' growth phases, one at very low cell density and another at moderately low cell density? Is this an important issue? It would be quite a bit of work to investigate carefully, so let's set it aside for now. 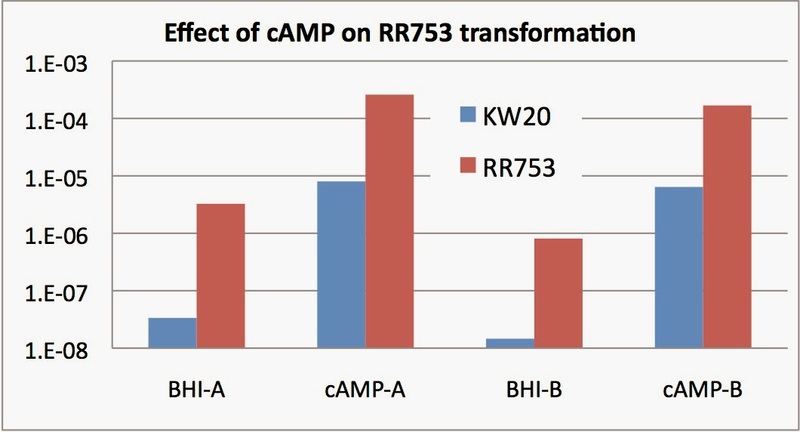 The next experiments analyzed the effects of adding cAMP (known to stimulate transcription of sxy) and AMP (known to reduce translation of sxy mRNA). I'll leave these for the next post. 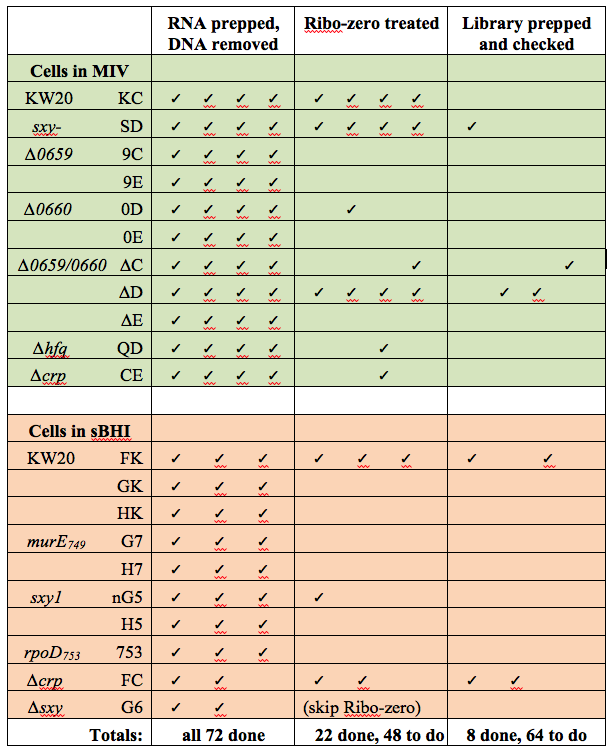 But here's an update on the RNA-seq saga. We've been struggling to get evidence that our RNA preps are of good enough quality for library preparation and sequencing. Because the Ribo-zero kits that we use to remove the rRNA from the samples are so expensive, we wanted to be sure the final mRNA concentrations and integrity would be good enough to make the equally expensive sequencing worthwhile. Unfortunately my attempts at using a Bioanalyzer have been very frustrating (and it's not cheap - several $ per sample), with odd smeary/spiky patterns and poor recognition of the size standards. This is partly because the concentrations are so low and the 'pico-RNA kits are very fussy, and partly because it's just a fussy procedure and easy (for me) to make mistakes. We sought advice from the person who will be preparing the sequencing libraries for us. She said that samples that appeared bad on Bioanalyzer results often gave excellent sequencing results, and suggested that we have her prep an initial 8 libraries. She would then pass these on to the person who does the sequencing, who could just run her initial quality checks on the libraries and tell us whether there were suitable for sequencing. So that's what we did, and the news was good - these initial libraries look OK.
Now it's time to do the Ribo-zero and final clean-up on the rest of the samples, so they can be handed over for eventual library prep and sequencing. There's a two-month backlog so we likely will get the results as a Christmas present. We have accidentally wasted two of our Ribo-zero treatments on duplicate samples, and I was thinking that this meant that we'd have to buy another 6-sample kit ($650). But now I think we can get by without this, either by not treating two samples (the G6 samples in the table above) or by using slightly less of the reagent for a subset of samples. We had been using only 1 µg of total RNA for Ribo-zero treatment, but for these samples we'll sue all the DNase-treated RNA we have (typically several µg). In some cases the volume of sample will be too high (max 28 µl for Ribo-zero), but singe the samples are in H2O we can just evaporate them a bit to decrease the volume.